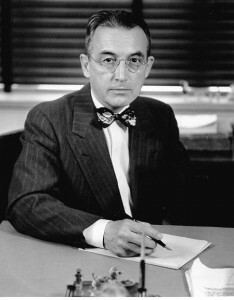 Altmeyer at his desk on his last day on the job as Commissioner, April 10, 1953. Courtesy of the SSA History Archives. 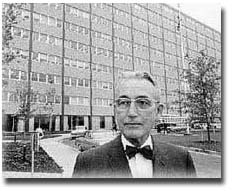 Arthur Altmeyer, who was a member of the first Unitarian Society of Madison, Wisconsin, is known as the person who did more than anyone else to shape the institution that administered the Social Security Program of the United States. 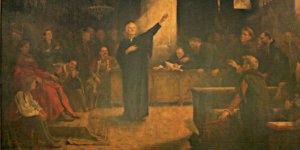 He worked closely with fellow Unitarian, U.S. Representative Thomas Eliot of Massachusetts, to draft the enabling legislation. Altmeyer was born in DePere, Wisconsin. He obtained a B.A. from the University of Wisconsin in 1914 and subsequently taught high school and was a high school principal. He then became a statistician, advancing to chief statistician and later executive secretary of the Wisconsin Industrial Commission. After being awarded his Ph.D. from the University of Wisconsin in 1931 and writing two books, he was summoned to Washington in 1933 by President Franklin D. Roosevelt where he became chairman of the Social Security Board in 1937. His retirement from government service in 1953 ended an era of shaping the nation’s social insurance program. 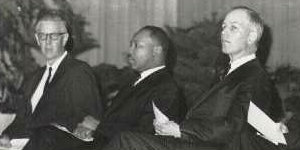 He remained active in social welfare policy, however‚ he served as an advisor to foreign governments and in 1954 was elected president of the National Conference on Social Work. 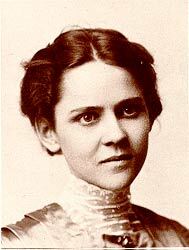 A young Ethel Thomas. Courtesy of the SSA History Archives. Altmeyer was a modest, serious, and dedicated career public servant. In 1916, he married Ethel Thomas, his former high school history teacher who was four years his senior. They remained married for 56 years, until Altmeyer’s death in 1972. 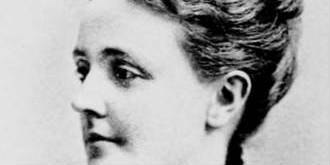 Yet although they had no offspring, the Altmeyers’ concern for the welfare of children, the elderly, the disabled, and all members of society was evidenced in their chosen professions striving for the public good. When Franklin D. Roosevelt ascended to the office of President of the United States of America in 1933, he inherited a country shattered by the economic devastation of the Great Depression of the early 1930s. Before that catastrophe, “there was no precedent for a social insurance system in United States law,” thus no established guidelines for how to assist both the self-sufficient and the needy in maintaining acceptable living standards even in times of duress, ill health, and/or old age. Faced with continuous partisan antagonism by Republican opponents and widespread, misleading propaganda generated by fearful naysayers, President Roosevelt vowed to give the American people once again a sense of security and, therein, hope for a better future. 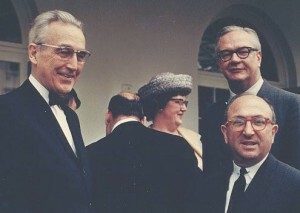 Arthur Altmeyer, Robert Ball (taller man in back), and Wilbur Cohen on the porch of the White House, May 5, 1965, at a ceremony where President Johnson honored the 20,000,000th Social Security beneficiary. Courtesy of the SSA History Archives. Altmeyer, during his nearly 20 years of leading the charge for the Social Security program during the Roosevelt and Truman presidencies, was instrumental in ensuring that this new social welfare policy would be designed, administrated, and legislated as comprehensively and efficiently as possible. Originally conceived as a means to help provide financial stability for the elderly in retirement, Altmeyer’s advocacy and devotion eventually lead to the expansion of Social Security’s coverage to orphans, widows, unskilled laborers, and the self-employed. Despite the fact that his desire to also have Social Security supply health insurance coverage and disability benefits was never fully realized during his tenure in federal government, Altmeyer persevered in championing the ideal of a broad, fair social insurance program that provides protection to society’s most vulnerable members when they need it most. Thus, “Mr. Social Security,” as Altmeyer came to be known, helped to forge one of the world’s most enviable government programs and leaves behind an incomparable legacy of dedication. Altmeyer was honored by the National Council of Churches of Christ in America in 1955 although the organization did not admit Unitarians. 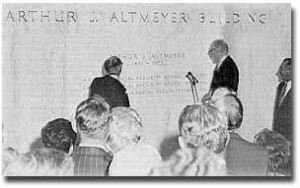 Former HEW Secretary Wilbur Cohen, Social Security Commissioner Robert Ball, outgoing Under Secretary John Veneman, and others on hand for the rededication of the Social Security Administration headquarters in honor of Altmeyer view the inscription on the building’s marble walls. 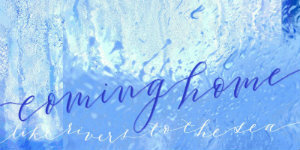 Courtesy of OASIS. On August 14, 1935 the Social Security Act became law. Workmen’s compensation was the only form of social insurance in which the United States had comprehensive experience before 1935. Even now, after more than half a century, not much more than half the workers of this country are protected, and one State still has no law to compensate workers injured on the job. The first meeting of the Social Security Board, August 23, 1935. 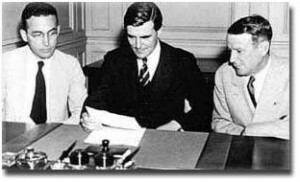 Left to right: Arthur Altmeyer, John Winant, and Vincent Miles. Today some 40 million people are insured. Even so, social insurance is new in the United States and incomplete in coverage and scope. As coverage is extended, it will go far toward cutting down poverty and insecurity. But however comprehensive the insurance provisions, we shall always need a complementary program to the needs of people who are not eligible for insurance benefits or their need is greater than the system is designed to insure. Recall some of the remarks made about social security in 1935 and 1936. It was unconstitutional. Unworkable. A first step toward communism. 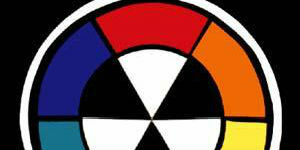 It would destroy individual enterprise and initiative. Actual experience quickly belied all such charges. The program has worked — better in some respects than its sponsors dared hope. Disbursements under the program have been less than was estimated in advance. The less tangible fears could have been discounted in advance. The United States was far stronger, freer, and richer than it could have been if the alarmists who opposed such legislation had had their way. Freedom to be sick or hungry is not a freedom to be prized. 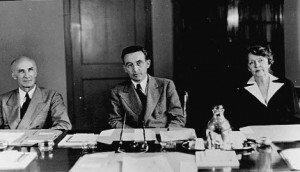 Altmeyer as Chairman of the Social Security Board in 1939 with Board members George Bigge (left) and Ellen Woodward (right). Courtesy of the SSA History Archives. 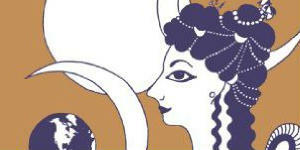 Social security does not endanger the moral fiber of the Nation. The program has been replacing part of the wage loss of workers who find themselves unable to earn and helping people who lack the means of subsistence in even a period like the present. The operations show that Americans continue to prize their capacity for self-support and family support and will and do work when they can. That idea has permeated much of our thinking. We see it in letters from old people telling of their joy in receiving the small benefits which, with their other savings, will enable them to live out their lives in independence and modest comfort. Widows write that the benefits on the dead father’s earnings will enable them to give their children a fair start in life. We see it also in appeals from those who write to ask why the program is not extended to their kind of work so they, too, can earn this assurance for themselves and their families. When it comes to proposals for improving the program, we hear the same objections that were made 10 years ago. I believe, as in the past, they will prove groundless. Altmeyer in front of the SSA headquarters in Baltimore–May 1963. Less than 10 years after this picture was taken the building was renamed in his honor. Less than 10 years after this picture was taken the building was renamed in his honor. Assistance will seem a stigma to most people. But as communities recognize the right to assistance for a minimum level of decent human existence, they will help to wipe out the conditions that make for hopelessness and perpetuate dependency. The Social Security Act is built on the assumption that it is hope that leads people to exercise initiative and assume responsibilities of citizens. Now we are beginning to think in terms of risks to economic security that strike nearly all families at some time. Our program is still far from complete. Workers and their families still lack any comprehensive insurance provision against two prime causes of poverty and dependency– wage loss in sickness and disability and costs of medical care. Enlightened self-interest, as well as common humanity, requires that we set a floor beneath which human beings in our civilization shall not sink. Only in that way can an industrialized society preserve political democracy and a competitive economy in accordance with our traditions. By such a minimum, we help to ensure an effective labor force and the steady stream of widely diffused purchasing power needed to keep workers steadily and fully employed. Our success in achieving “domestic tranquillity” and lasting peace will depend in no small measure on the ability of this and other countries to achieve greater security for their peoples. In these first 10 years we have laid the foundation for that effort. 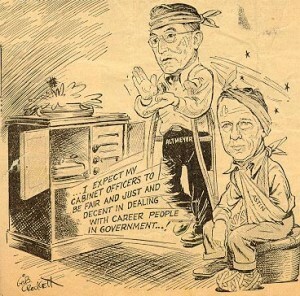 A 1953 editorial cartoon expressed what many felt was the unfair treatment suffered by Altmeyer in his abrupt dismissal after the Eisenhower Administration took office. Altmeyer was directly involved in the development of Social Security from before the Social Security Act became law under President Roosevelt on August 14, 1935, throughout the next two decades. He persisted during two subsequent amendments to the law — the 1939 amendments, which established earlier benefit start dates, larger payments, survivors’ benefits for orphans and widows, and an appeals process, and the 1950 amendments, which increased benefits further and extended coverage to agricultural laborers and most self-employed workers — neither of which fully enacted the more extensive agenda Altmeyer favored. When the White House changed hands to Republican Dwight Eisenhower in 1952, however, Altmeyer found himself amidst a presidential administration that was not as amicable as the previous two he’d served under. Although he had already announced that he would retire from government service at the minimum retirement age on May 8, 1953, an executive reorganization plan eliminated both the agency Altmeyer reported to and his formal job title before he could depart graciously. Being forced out of a long, illustrious federal career did not embitter Altmeyer, and, with public sympathy behind him, he continued to contribute to the progress of social welfare insurance policy in the United States and abroad until his final days. It is hard to say good-bye to the work of a life-time; but it is even harder to say good-bye to all of you who have made a living reality of these great social measures entrusted to us for administration. However, my sadness at leaving is tempered by my realization that these programs are now firmly established as a part of the American way of life and that you who remain will carry on as you have in the past, serving the people of this country loyally and efficiently. Words cannot express my gratitude to all of you. Good-bye and God bless you. Altmeyer, Arthur. The Formative Years of Social Security. Madison, WI: University of Wisconsin Press, 1966.